Arsenal put forward a tough fight to turn defeat into victory when they faced Preston North End at Deepdale on Saturday. 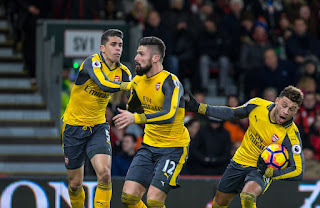 Aaron Ramsey and Olivier Giroud ensured their side did not either get an option for a replay or crash out of the tournament. The win caused celebration among Arsenal players who took to social media networks to pour out their excitement. Below are some tweets from the players. The result has sealed Arsenal's progress to the fourth round. It was also a good one for Arsene Wenger who maintained his record in the competition. He has never lost a third round tie in the FA Cup since he arrived in North-London. 21 played, 21 won.